Cooler colors for Miragaia to contrast with the firey colors of Brachytrachelopan. I'm not really sure about this one, but I do like the color scheme. I hope you all liked this rousing round of live-blogging! I'll probably tweak ALL of theme images for the actual Art Evolved show which is coming up in November. And as always, your comments are welcome and appreciated. Next-Day Impressions: Oh my god, did I draw this? Was I DRUNK? This is the worst stegosaur I've ever drawn. It's like I squatted over a bed of newspapers and "produced" this awful picture. Now, I still like the colors, but geezus the anatomy is horrible. The tail is longer than the body, the body itself looks nothing like a stegosaur, and YE GODS what's up with the skull? Obviously, I'll be redoing Miragaia. I urge you all to look away. i personally really like this one. the post is cool, and love the colour scheme. Nice. Really compliments the hot lava-ness of Brachytrachelopan! Funny that you say stegosaurs are hard to draw, I find them the easiest of dinosaurs to get right. Then again, I haven't drawn one in such a dynamic pose, they're usually just standing there facing the left of the page. digital artists flaunting the ctrl-z combo salute you! 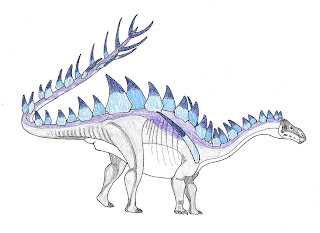 If you are having so much trouble deciding how the back half of the skeleton should look, why not base it off Dacentrurus, the stegosaur found to be the closest cousin of Miragaia (and indeed, even forms a clade with it).